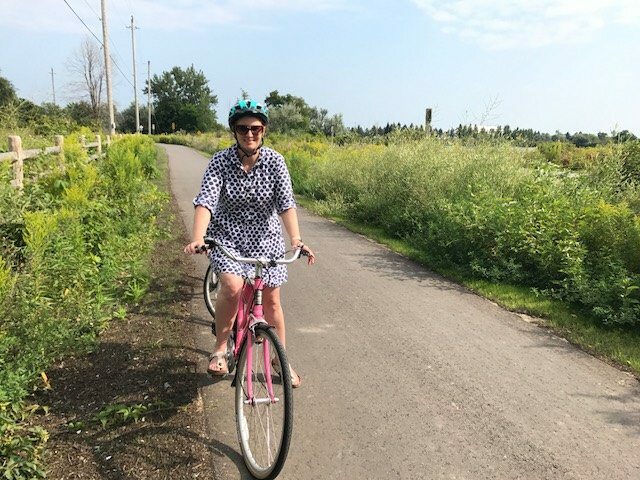 This week, Margaret Harvey rode her bike on a trail for the first time since she was run over by a garbage truck in 2012. It’s taken five long years to get to this point, and Harvey has had to learn to walk all over again before she could ride. She still feels vulnerable from lingering injuries, including a fractured pelvis. Harvey’s accident happened as she was riding on the Jarvis bike lane that was removed under Rob Ford’s administration. But thanks to to a new squad of Toronto Police Service parking enforcement officers, riders like Harvey are regaining the confidence to cycle again. Harvey is slowly returning to cycling after an injury. Photo by Alisha Sawhney. Kyle Ashley, an officer who goes by @TPS_ParkingPal on Twitter, invited Harvey to join him one afternoon for a ride-along. “The work that he’s doing; I’m watching it on Twitter, and it’s making me feel more ready than I would otherwise,” says Harvey. Ashley, along with two other parking officers, have been permanently assigned to a full-time bike lane ticketing beat in the downtown core. To zap bike lane invaders, the two-wheel trio uses Twitter to name and shame companies that force cyclists out into traffic. The City has pledged $150 million over the next 10 years for its bikeway network plan, but cyclists say the pace of the rollout has been frustratingly slow. There have been some recent bike lane upgrades on Gerrard Street and River Street, where there is curb protection for a block—but then it disappears back to a painted line. Toronto has declared itself a Vision Zero city, but according to Cycle Toronto, not enough has been done to move towards that goal. There are still large swaths of the city, including Scarborough, North York, and Etobicoke, that have no protected bike lanes. Last year, Toronto City Council also identified Scarborough’s Kingston Road as one of eight streets that could be configured to include bike lanes or bikeways. It’s part of the 10-year plan to add 525 kilometres of biking infrastructure to the city. According to Cycle Toronto’s submission to the City’s Public Works and Infrastructure Committee, there are eight major streets that staff recommended assessing for bike infrastructure. Yonge Street, Bloor Street, Danforth Avenue, Jane Street, Kingston Road, Kipling Avenue, Midland Avenue, and Lake Shore Boulevard West were to be divided into 17 segments and studied separately. However, the proposed studies have been put on hold until late 2018. It’s a problem echoed by Councillor Mike Layton (Ward 19, Trinity-Spadina), who recognizes that it will take a dramatic shift in the political will of the City to expedite Toronto’s bike plan. “We aren’t seeing the infrastructure being built at the rate that we’re seeing in other cities,” says Layton. 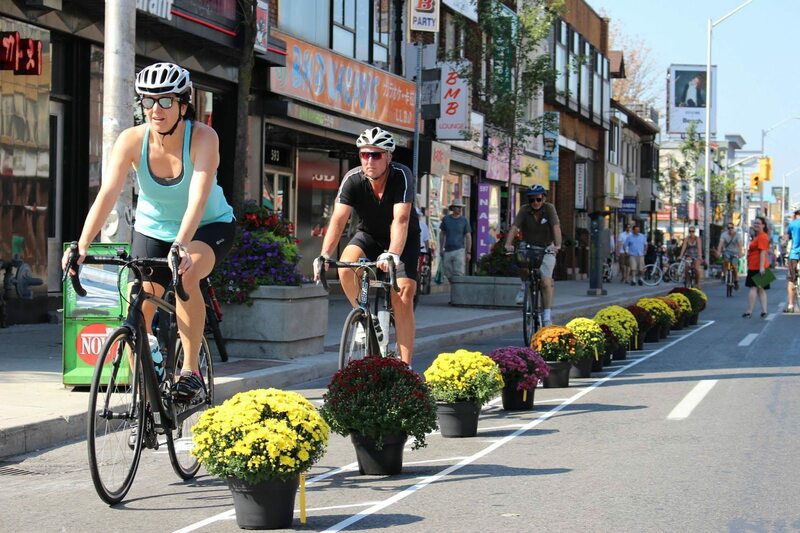 He hopes to see the Bloor Street Bike Lane Pilot Project become permanent, as it is up for City Council review this fall. Layton, who rides along Bloor Street almost daily, says the number of cyclists has skyrocketed since the bike lane’s inception. Preliminary data reveals that people who weren’t cyclists before are now choosing to bike because there are safer options available. “The bike lane on Bloor is so critical because it’s that backbone right across the city that allows more people to get out of their cars,” says Layton. Fifty-five per cent of all trips that Torontonians make are less than seven kilometres in length, which can typically be travelled by bicycle in 30 minutes or less, according to Cycle Toronto. Layton urges cyclists, especially outside of the downtown core, to start demanding that a minimum grid be built per neighbourhood so travelling to school, community centres, and libraries can be bike-first choices. Still, attitudes about bike lanes are beginning to shift, according to those on the ground. Ashley, who has become a social media sensation as one of Toronto’s “bike lane guardians,” has noticed companies modifying their behaviour after they’ve been publicly shamed on Twitter. Ashley says Beck Taxi has been leading the way in positive road behaviour—a promising sign that the three-person enforcement squad is effectively targeting motorists. “Twitter has been a great tool because it’s allowed us to discuss things with companies directly,” says Ashley, recounting a time when he tweeted a photo of an illegally parked TDSB trailer. He contacted TDSB right away and the trailer was removed. At the end of July, Canada Post pledged to not block bike lanes, instructing its employees to adjust delivery and drop-off locations. Ashley hopes to see these expressions of change coming from FedEx, UPS, and Purolator in the near future. It’s the carelessness of vehicles like these that intimidate cyclists like Margaret Harvey from riding again.